My friend’s father acquired his own beehive a few months back and this is from their first honey harvest this year. I’m not sure of the exact stats but I think this is one of about 50 jars that was produced – that’s a lot of honey! 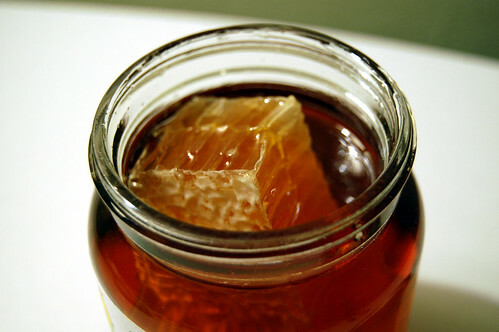 I’ve not yet attacked the honeycomb but the honey itself is very tasty and surprisingly, not too sweet. I’ve been taking teaspoonfuls of it! Lately, I’ve been mixing it with some lemon and hot water for a nice soothing drink for my sore throat. Thank you for the lovely gift, Rachel! with most of the honeybees non-existent, this is definitely liquid gold!! you are so lucky! wow this looks wonderful. This is the best gift ever. The little label is so cute too! Unfortunately, we don’t have citrus trees in this country. Because, if you put your hives in a citrus grove, the result is heavenly, especially at blossom time. kat: Oh, I hadn’t thought of that! Then I am very lucky! 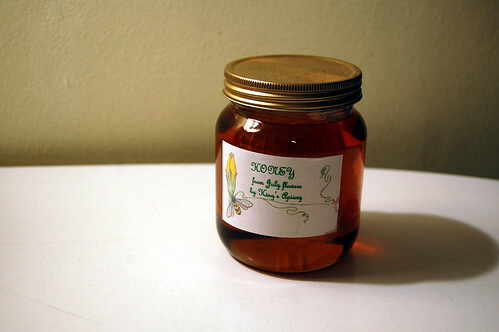 travelrat: I was also recently told of rosemary honey which is supposed to be quite lovely. Must keep a lookout for both! Heather honey’s quite well spoken of, too. The citrus honeys I tried are a Sicilian specialty; I guess you’d find them in a shop that sells Italian food.